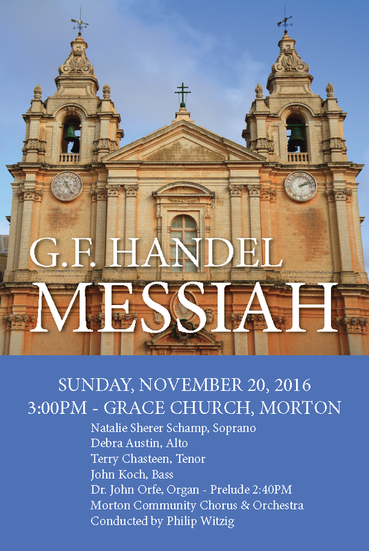 Messiah will performed Sunday, November 20, 2016 at Grace Church in Morton, IL. Although Grace Church graciously allows us to use their beautiful sanctuary, Messiah is a community event, performed by the Morton Community Choir and Orchestra. 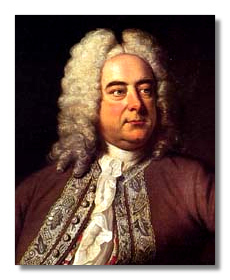 A free-will offering will be taken during the Pastoral Symphony. See a few pictures from last year's performance here. Listen to the wonderful radio spot produced and played on WBNH Radio here! Thank you, Jim Huber, Daniel Cushman and WBNH! WCBU FM Peoria Public Radio and Arts Partners of Central Illinois radio program "Out And About" interviewed Phil Witzig regarding Messiah 2015. Containing soloist information and dates about last year's performance, it nonetheless has some interesting dialog regarding the production. Listen here. Natalie Sherer Schamp, Soprano – Natalie completed her undergraduate studies at the Manhattan School of Music and Wheaton College, and graduated with a Master of Music degree in Piano Performance and a Collaborative Piano Cognate from Roosevelt University. Natalie is pursuing performance opportunities as a solo and collaborative pianist and soprano. Natalie was a soloist with us in 2014 and we are delighted to have her return! Debra Austin, Alto – Debra graduated from Bradley University with a music education degree, and later from Northwestern with a Masters in vocal performance. Debra has sung professionally all over the United States, including with the Chicago Symphony under the direction of Sir George Solti. She currently holds the position of Instructional Assistant Professor of Voice at Illinois State University. Terry Chasteen, Tenor – Terry is a Professor of Music in Voice at Western Illinois University. He holds a Bachelor degree in Music Education from West Virginia Institute of Technology and a Masters in Vocal Performance from Indiana University. Terry’s career as an operatic and concert soloist has taken him throughout the United States and to Austria, Germany and the Czech Republic. John Koch, Bass – John is Vocal Arts Coordinator and has been teaching voice and vocal pedagogy at Illinois State University for over 20 years. He has performed over 75 operatic and oratorio roles internationally and was twice a National Finalist of the Metropolitan Council Auditions. He recently sang the baritone solo role in Carmina Burana with the Heartland Festival Orchestra. Dr. John Orfe, Organ – A talented musician and dedicated composer, Dr. Orfe came to Bradley University in 2008, where he teaches music. He is also extremely involved in the music performance community, actively performing with several music ensembles, including a new music ensemble “Alarm Will Sound” which he founded. Come early to get good seats and to listen to his outstanding prelude! If you would like to sing, contact Phil at kliyd@outlook.com or call 815-200-9555 (mobile).